Haunted Hell Nashville is a Haunted Attraction located in Antioch, TN. Team Zombillies reviewed this attraction on October 28, 2017. Haunted Hell Nashville (“HHN,” though not to be confused with Halloween Horror Nights) is now in its 5th season of operation and takes place in a 22,000 square foot building on the southern outskirts of Music City. We’d had the pleasure of visiting HHN for some of their off-season events, but this was our first official visit during the peak of haunt season! This is what we call more of an “old school” haunt mixed with a few high-end animatronics and a wide variety of scenes and actors that’ll give you a good selection of frights. 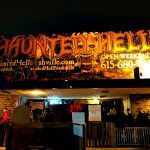 The gateway to a living Hell has been opened and you can see it for yourself at Haunted Hell Nashville! We were informed that HHN runs close to 40 actors on a typical night. However, they also told us that they were short handed on the night we attended. This was made evident when we didn’t see any actors at all in a few of the scenes and larger areas. One could normally expect these positions to be occupied on a night when they’ve got a full crew of actors, though it’s usually ideal for a haunt of this size to have more than 40 cast members on the roster. This was also one of the most energetic groups of actors that we saw during our haunt trip to Nashville. 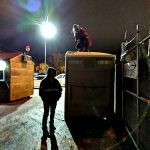 The actors were working with their scenes, beating and banging on things, climbing around on the furniture, making a lot of noise and verbally interacting with our group, doing their best to make sure everyone was well out of their comfort zone! Some of them were in places where they could work multiple scenes, so even once we thought we’d escaped their clutches, we’d still see them again after another scene or two! The costuming on the characters we saw at HHN was largely adequate. While none of them were realy “over-the-top” or hyper-realistic creations, each of them looked like they belonged in their respective scenes, clothing articles were authentic and we even saw some good makeup applications. One of them appeared to have “REDRUM” carved into their forehead, we saw a really cool-looking doll face girl and the clowns were wearing some unique face paint as well. Jason Voorhees was appropriately-sized for his role, but his costume seemed to be a bit off the mark (that is… if he was trying to portray the most iconic version from the movies). Very few masks are used at HHN, but the ones we saw were appropriate for the characters wearing them. We approached HHN from the interstate, so we caught a glimpse of the back side of the building before driving around to the entrance to the parking lot. The large “Haunted Hell” sign and the old hearse on the roof let us know we were getting close and, when we saw the large, paved parking lot full of cars, we knew we’d arrived at our destination! On their busiest of nights, parking can be limited with lots of people making their way into and out of the haunt, so do be careful while you’re looking for a spot to park. The ticket booth is located in a window just to the right-hand side of the entrance. Friendly and professional staff members helped us get our tickets and we noticed a couple of queue actors keeping the line entertained. The clown even drew a crowd as he was waiting for an unsuspecting victim to come out of the portable restroom! 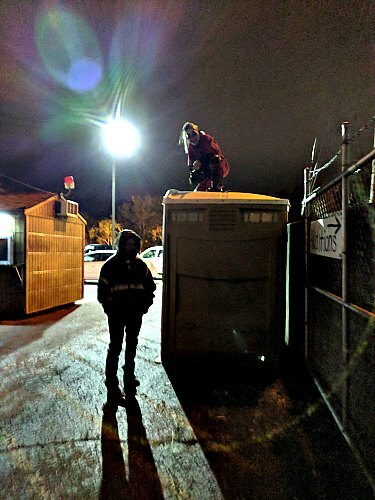 It may also be entertaining to know that he was waiting on the ROOF of the porta potty for her and he was a chainsaw slider! We don’t see those often! Also, a burn barrel was stationed near the entrance, which was a welcomed sight on a crisp October night. Navigating the inside of the haunt is pretty easy and most of the paths are flat, smooth and wide open. There is one particular area with slanted floors and strobes, but the walls are mostly close enough that you should be able to keep from completely losing your footing. Everything else seemed to be extremely safe and emergency exits were in place throughout the haunt. One of the most prominent features of HHN is their large set designs. During our tour, we came across a huge mansion facade, an outdoor area with trees and vegetation, a section of highway (complete with oncoming traffic), heavy construction equipment, a cemetery, a cave, giant monsters and even some high-voltage electrical transformers! We often found ourselves saying “Well, that’s cool!” or “That’s different” simply because of the creativity that’s put into some of the different areas. Some other things we found here that we don’t see very often include the use of astroturf in the outdoor scenes, a revolving darkroom door, back-to-back vortex tunnels that were angled from one another, a huge blackout maze and a clever implementation of some galvanized sewer tunnels! To be fair, we must say that scene detail varies quite a bit throughout the tour. While some areas consisted of mostly black or undecorated walls, others were extremely well detailed and looked like the real deal, such as the mansion facade and the highway scene. The one thing we saw that was especially misleading was in the blackout maze; the exit is actually labeled as an emergency exit, so some customers may see it and not go through it for fear of ending the experience too early. But, one of the actors confirmed that it was the correct way out and there were, in fact, a few more scenes after it. There wasn’t an overall storyline or theme explained to us before entering. Though, there is a short description of what lies within this Devil’s madhouse on the homepage of their site. You will stumble upon an old plantation home and follow a creek bed to the “urban underground of madness.” From there, you will be thrown into quite an array of scenes from a children’s room, an electrocution scene, a clown area, a photography room, the land of dots, a dental area, a bowling alley, a crash scene and many other areas until you eventually end up in a landfill. 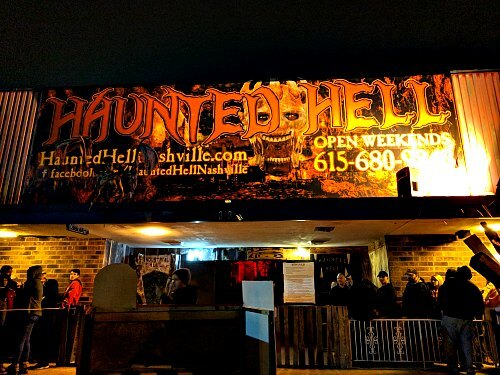 Quite a mixture of scares were experienced at Haunted Hell Nashville. From sudden blasts of air, greatly disguised hiding spots and disorienting areas to intimidating characters and total darkness, we never knew what fear these folks were going to prey on next. They also made us feel pretty uneasy in several areas. Of notable mention was the electric chair scene where water was surrounding the chair with a helpless victim strapped to it. As we walked around it hoping to quickly get out of the room before it went off, it began to buzz right when we were in the middle of the room! We are sure this setup will have others questioning whether they will be shocked too. Another potent scare tactic was used in conjunction with their giant actormatronic boar head. For those that don’t know what an actormatronic is, it’s an animatronic prop that gets moved around by an actor, which gives it a more realistic movement than pneumatics or electronics can provide on their own. We can’t ruin the surprise, of course, but we can say that we haven’t seen one of these used this way before and it absolutely nailed the people who were behind us in our group! Kudos for the diversity and persistence with that one! General admission tickets range in price depending on when you go. Earlier in the season, they were priced at $18.00 per person and, later in the season, they were priced at $20.00 per person. Speed Passes are available for $30.00 per person and will shorten your wait in line. As previously mentioned, there is a large maze that each group will have to navigate (or get lost in) that will be a major contributing factor on your group’s tour time. Somehow our group managed to get out of it pretty quickly, but some may be stuck in there for a while. Our total tour time was about 26 minutes. When considering general admission pricing during our visit, that brings their MPD (minutes of entertainment per dollar spent) to 1.3, which is just below the average of 1.5 that we’ve seen the most often in the past. Regardless, this is still a good value for the price considering the uniqueness and diversity of the show! We grinning from ear to ear the whole way through, saw some clever tricks and a lot of different things that we haven’t seen before. Should you deem yourself prepared to embark on this hellish journey, don’t touch the demons, as you might leave with a few things missing… that is, if you leave at all!